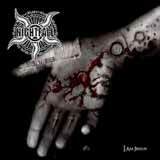 Nightfall returns with a controversial new album mostly due to its title I Am Jesus. Please rewind… the band has been around for more than 10 years and started it out as a death metal band, soon peering at black metal horizons, then made a total u-turn to the dark metal side with the release of Lesbian Show, an album that was supported by a massive promotional campaign that made me buy the limited edition containing a promo video. I can’t believe I bought this stuff once as I still consider this album as a total joke, but I admit it was a total success in the marketing process. Anyway, the band continued its own way with the previous album Diva Futura and this new opus is to me their best effort to date. Indeed I Am Jesus has everything to become quite a successful album. The music is very entertaining and quite diverse to keep the audience’s interest for more than the first couple of songs contrary to some of the previous albums the band has delivered. This is probably due to the fact that the band went through an almost complete line-up change except for its mainman, bass player and vocalist Efthimis Karadimas who has been on board since the beginning of the Nightfall adventure. Their mesmerizing symphonic dark metal tainted with keyboards and haunting atmosphere isn’t innovative at all, but succeed in refreshing the style, and features a bunch of catchy melodic songs. In fact, typical dark metal bands such as Dark, Aeon or Crematory never raised more than a passing interest in me, mainly due to the fact that they navigate in between different metal trends such as heavy, gothic, death even black metal. However, some bands such as Eternal Tears Of Sorrow, Alastis or Evereve once succeeded to give dark metal its definitive letters of nobility. Nightfall were not among them, but now with I Am Jesus they managed to enter the limited circle of interesting dark metal bands.